I've had Carla's (Granny Maud's Girl) Possum Magic quilt sitting here for a few weeks now, and I decided to work on it on Sunday. The next deadline isn't until January 19, but that's prime summer holiday time in New Zealand, so thought I better work on it now. The photo below shows what it looked like when I received it from Alice (Blossom Quilts). Alice had added a lovely meandering vine around Rebecca's flowers. I knew before I even received it what I was going to do for my border. I'd seen an idea in Gwen Marston's Liberated Medallion Quilts book that I wanted to try, and I had the perfect fabric on hand. My plan was to fussy cut the flowers in the beautiful floral fabric, and frame them with the bright fabrics you can see in the photo above. The feature fabric is from the Art Gallery Dreaming in French collection - Light Femme Fatale. I started early on Sunday morning, but quickly decided that I needed to add some blue to my border to pick up on the blue that Rebecca (One Wee Bird) had used in her border. Can you believe she paper pieced all those flowers and ladybirds? Fortunately I had some teal on hand that worked in well. I didn't want Carla to think that I had used too much pink and mauve, so I toned it down with the teal. I think it worked well. Following Gwen Marston's lead, I didn't fuss too much about the corners. I didn't make four corner blocks, but instead cut down two of the normal blocks to finish the rows nicely. You can see one in the front left hand corner in the photo below. the other is in the top right corner. They blend in well and are hardly noticeable at all. Carla's quilt now measures 60" x 60"
It was all finished before 5pm on Sunday afternoon and I'm happy with how it turned out. My border still has a fair bit of green in it, and continues the garden theme with the flowers. It's pleasing to know that I can turn something I pictured in my mind into reality (well quilt wise anyway). Carla's quilt is now 58" x 58" square. 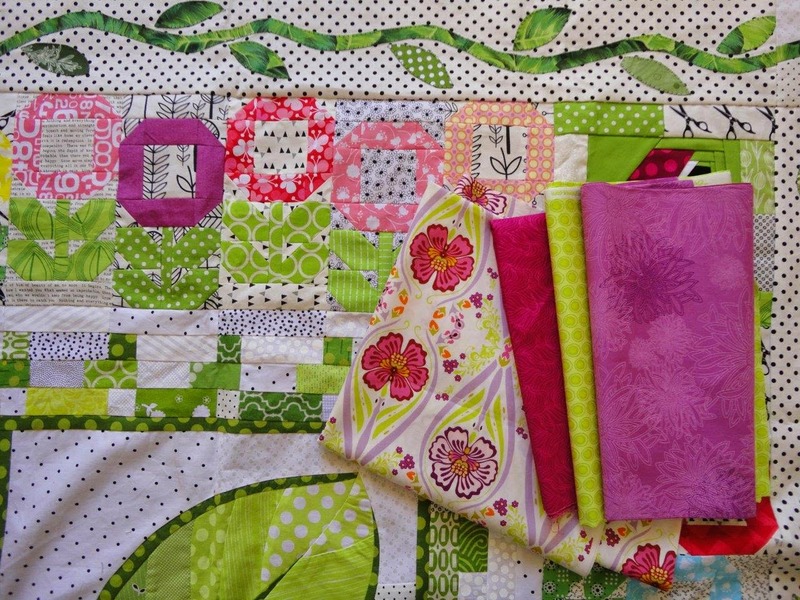 You can see all of our Possum Magic quilts on the tab just under my blog header. We are a group of 8 bloggers from New Zealand and Australia who met online in June 2014. We organised our own local round robin and each made a centre block. Those blocks are all travelling around in a circle, and we will each get our own back in mid 2015 with 7 borders added to it. Besides getting a quilt back at the end, we've made some great quilting friends. Great idea!!!! It's the perfect compliment to the other borders. I just know that Carla is going to love it! :D How could she not? This works so well, Wendy! The featured floral print is just right, and the colors you used to frame the blocks are spot on - the blue/teat really does help pull out the flowers from Rebecca's border! I love the borders you've put on. The colours are perfect for this top. How many more rounds? The border looks great Wendy & the teal definitely gives it more zing. How many borders are on it now? It's looking fantastic. 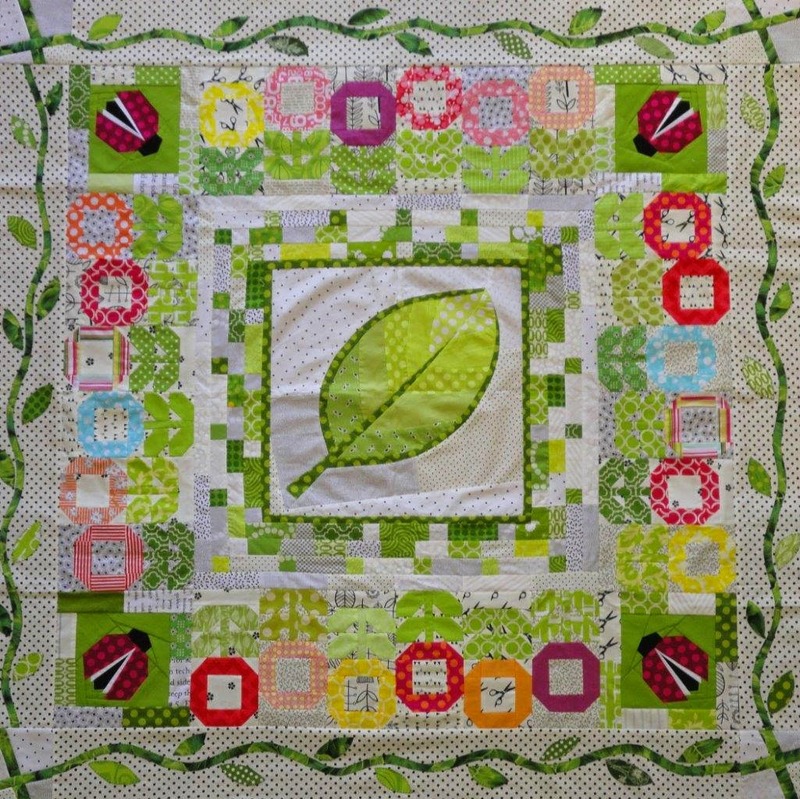 I love your border, it suits the overall quilt so well. I am enjoying these Possum Magic quilts! I agree that the teal was the perfect addition! The whole piece is wonderful! Excellent border choice - well done! I love seeing all the Possum Magic quilts - you all are so creative! oh! Sooo lovely! I have never seen a Possum Magic quilt, looks like fun! And I am impressed how your addition fits right in! great idea! The borders is excellent - as is the whole quilt! Happy Xmas and New Year. What a fun project! 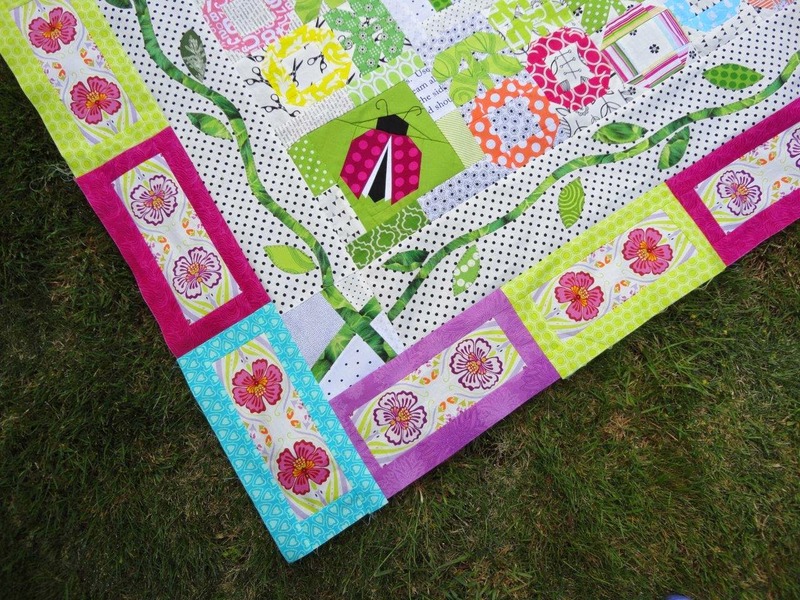 This type of quilt is perfect for a move-along type bee! I love the colors and design. I'm totally jealous you are enjoying summer weather! Thanks for sharing! Thank you Jennifer. Do you realise you are a 'no reply blogger'? Thank you Maartje. Do you realise you are a 'no reply blogger'? It's gorgeous! All the borders are working so well with each other! 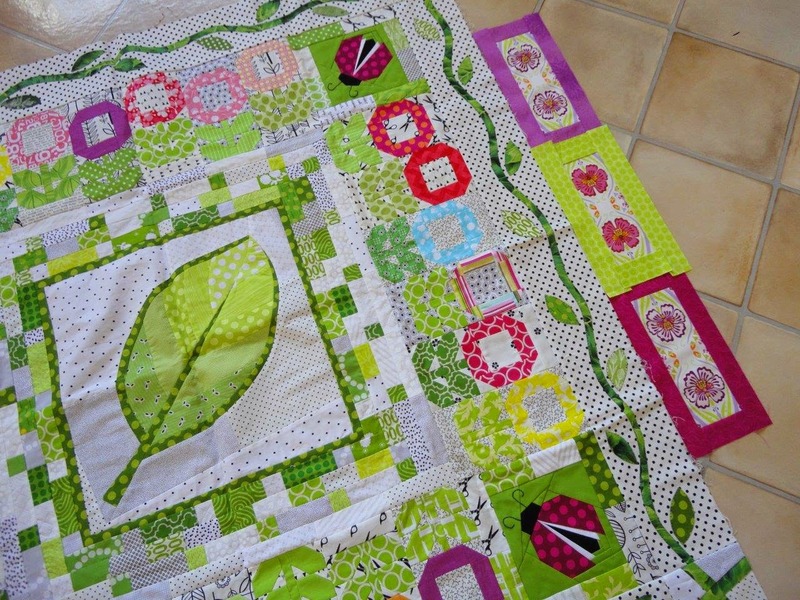 I have visited your blog today from a link in Carla's post about this quilt! I love what you have done with her leaf! All of you in this group are amazing. Love your work. This is beautiful - love your border. What a fun thing to do with NZ and Aussie girls. I love what you have done Wendy! It really works brilliantly with the previous rounds. You guys are so talented! The last border really complimented the inner blocks. You chose well! I love the fresh, bright colours. Such a welcoming quilt for anybody to enjoy.